Of all that’s been written about the latest film adaptation of one of the most iconic works in American literature, this much is true: it is inherently faithful to the spirit of the novel — or, as the headline for critic David Edelstein’s review in New York magazine put it, “The Colossal Vitality of His Illusion.” And that’s no small thing. 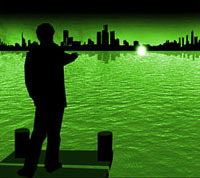 Gatsby’s “green light” at the end of the pier has never become a hackneyed concept to me. The poignancy of this enigmatic character, who so doggedly places all his hopes and dreams in someone intrinsically unworthy of the purity of his inspiration, has always had tremendous resonance. Far beyond its significance as a paragonic parable of American culture in the 1920s, and its timeless truths about the callousness of the rich, Gatsby is at its core about one man’s mythical invention, which, though folly, reflects a touching dignity that stands as a testament to the tenacity of the soul. She also alludes to an interesting aspect that struck me as I watched the film, which has to do with the pronounced lack of romantic chemistry between the actors at the center of the story — Leonardo DiCaprio and Carey Mulligan in this case, for those who’ve been hiding in a cave — and which I intellectualized as being perhaps not an important thing, because in the end, the character of Daisy Buchanan is no more than a blank canvas upon which Gatsby alone sketches his solitary and imperturbable imprint. 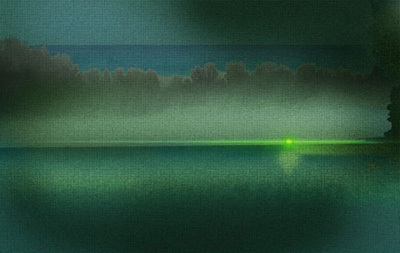 As it turns out, Schulz writes that Fitzgerald himself had once admitted that he “gave no account (and had no feeling about or knowledge of) the emotional relations between Gatsby and Daisy.” It really was all about the green light, bigger in mind and memory than any of the more pedestrian aspects of love and desire. Gatsby believed in that green light. And he wasn’t the only one. iconic novel and author. You are a great writer and movie critic. I enjoyed your review enormously. Bravo!